The next Final Fantasy mobile game will be a "live" experience, according to Square Enix. In an announcement published in this week's Famitsu, Square Enix revealed a free-to-play fantasy RPG, now with multiplayer and set in the world of a previous Final Fantasy game. Final Fantasy Agito is a smartphone game that begins in the same setting as Final Fantasy Type-0 where players began their journey at the Orience magic academy as a student. Agito players will begin their game in the same place as new player-customized characters. 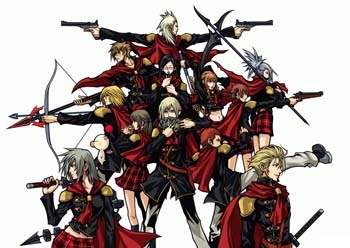 "I wanted to write a story that traced the different fates of the FF Type-0 heroes," producer Hajime Tabata told Famitsu. The game will make use of the parallel cycles of Orience from Type-0. When one cycle ends, another one -- albeit a slightly different one -- begins. "The decision system here means that the game should change gradually with each cycle," Tabata added. "We might have different decisions for you to make at the second cycle, or more choices to select from." Each cycle may have multiple chapters to it, but Tabata has not decided how many chapters to include in each cycle. He has said, however, that each chapter will last two weeks in real time. Tabata wants to make the game a "live" experience for players. The first 10 days of the chapter are for personal missions while the final four days are for team-play phases. To better challenge bosses as a team, it is important to boost skills during the individual phase. Final Fantasy Type-0, originally called Final Fantasy Agito XIII, was meant for release on smartphones but was instead released for the PSP two years ago in Japan only. Final Fantasy Agito will debut this winter.